This evening at the NCAA Division III Track and Field Championship Awards Banquet in Delaware, Ohio horizontal jumper Divya Biswal was named NCAA Atlantic Region Field Performer of the Year. The junior from St. Lawrence University enters this weekend’s national championship ranked second in the triple jump and third in the long jump. 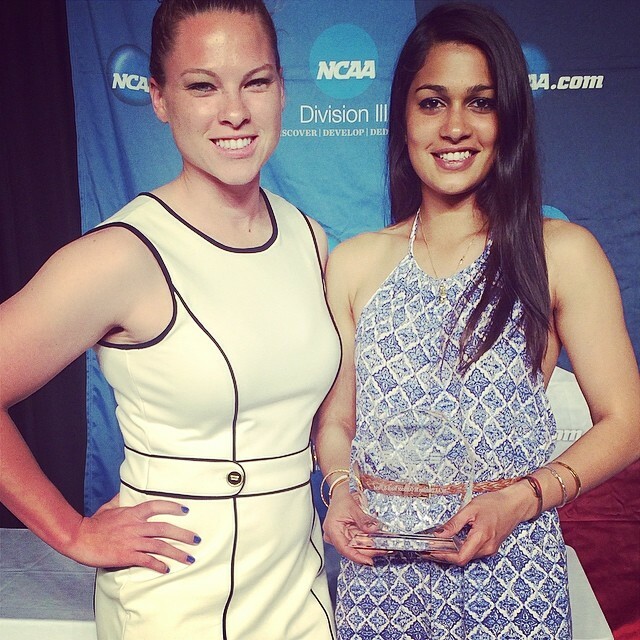 Divya had previously received the Atlantic Region Field Performer of the Year at this year’s indoor championships. Biswal has had a breakout spring, increasing her lifetime bests on multiple occasions in each event. Her latest assault was in the long jump where she leapt to an all conditions best of 5.91m last week in winning the East Coast Athletic Conference title while also pushing her personal best to a wind legal 5.63m. Divya gets started tomorrow afternoon at 3:30 pm Eastern, jumping third in flight one of the long jump final. The triple jump final begins at 3:00 pm on Saturday where she will jump third in Flight 2.